Investors who regularly invest in private equity real estate funds understand the problem of managing liquidity. Private real estate investors typically commit a fixed dollar amount to a fund in advance and make contributions as deals fall into place. This capital call process may take two to four years before the capital is fully invested. The challenge facing most investors is in how to effectively manage this funding liability during this period: should they hold it in cash or invest it in liquid securities? There are pros and cons to both strategies, but one strategy will build far greater wealth over the long run. Last year, we surveyed Origin’s investment partners and found that nearly 60% hold their uncalled committed capital in cash or short-term securities. This means that roughly $90 million of investible capital was earning little to no return when our third fund first opened. Many investors park their money on the sidelines as they wait for their capital to be called, but cash sitting in a bank account has zero potential for high investment returns. Cash is certainly the safest investment and we know it will be there when it comes time to fund the capital call. However, it doesn’t help maximize long-term returns because cash “drags” down portfolio performance and wealth can only be created when money is earning a return. The chart below illustrates the total return created while keeping capital commitments in cash. For this example, we assume an individual with a $5 million investment portfolio commits $1 million to a real estate fund that calls the money in equal amounts over four years. This chart shows the drawdown of the initial commitment and the returns of the private equity investment over a seven-year period, while the committed amount is set aside in cash. We assume the $1 million private real estate investment generates a 15% return over seven years and grows to roughly $1.9 million. The cash portion of the portfolio contributes nothing to this return. A 15% return is great, but how much additional money did the investor leave on the table by having their money sitting in cash, instead of in an investment? Investing the committed capital means it has the potential to generate a return, but it also has the potential to lose money. What happens if the market goes down and the investor no longer has enough capital to satisfy the commitment? The easiest way to manage this risk is by maintaining a healthy ratio of liquid securities to private commitments. For example, an investor with a net worth of $5 million could easily commit $1 million to private investments and keep the entire $5 million invested in public securities while waiting for the $1 million to be called. This is how large sophisticated investors manage their portfolios because they understand that cash positions need to be minimized in order to maximize returns. 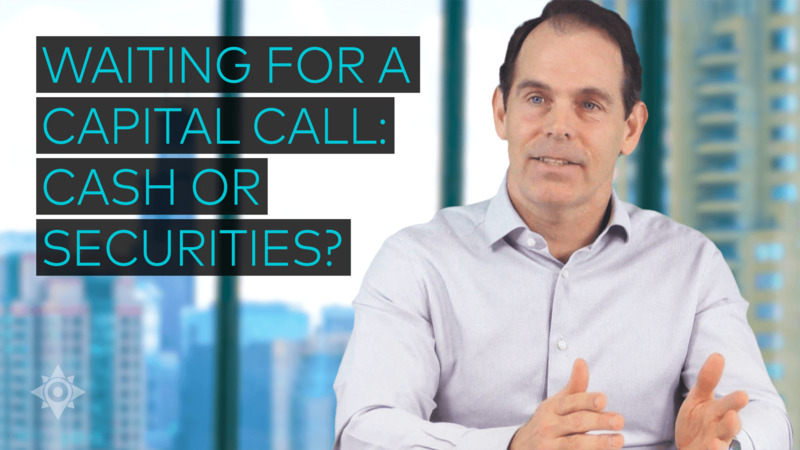 Watch Origin Principal Michael Episcope explain the differences between keeping your money in cash and securities while waiting for a capital call. Maintaining a healthy ratio between liquid and illiquid securities is key. If that same $5 million net worth investor were to just commit all $5 million to private investments, then the only choice they have is to keep the entire commitment in cash or short-term securities. The right ratio of liquid to illiquid investments really depends on the investor’s risk tolerance. Some may feel that 20% of their portfolio is a reasonable amount to commit to private investments, while others may feel comfortable committing 50%. In the below chart, we expand on the scenario above and calculate the incremental return generated by investing the $1 million commitment in public REIT’s, companies who own and operate commercial real estate, until it is called. The un-called portion of the commitment achieves an annualized return of 8% and produces an extra $294,000 over the seven-year period, or 30% more wealth. Managing risk around this strategy requires an understanding of what is likely to happen and what could happen. We all know the public market doesn’t deliver average long-term returns over every four-year period, but we do know that markets go up far more often than they go down. When we analyze NAREIT data between 1977 and 2017, 85% of three-year periods deliver positive results, while 89% of five-year periods deliver positive results. The best three-year period over this time frame delivered a 95% total return and the worst was -34%. The best five-year period delivered a 176% total return with the worst period coming in at around -10%. The odds of generating favorable returns are higher by keeping commitments invested in public securities, but there is absolutely the chance for loss. This is where having a healthy ratio of public to private securities pays off. Even if the market goes down 20% in the example above, there is still plenty of liquidity in the rest of the portfolio to fund the capital calls. The $5 million portfolio would decline to $4 million, with an outstanding commitment of $1 million. Also, keep in mind that a depressed public market may create better buying opportunities for private real estate and divesting of public securities in down markets is a great time for tax loss harvesting. More conservative investors who are determined to keep their capital commitments in a safer place should consider investing in REIT preferred securities. A preferred share is similar to a bond in that it has fixed payments and has priority over equity in a liquidation. It occupies a place in the capital structure between bonds and equities and typically yields between 5% and 7%. However, unlike a stock dividend, their fixed payments are contractual and can’t be changed. The tradeoff is high yield, lower volatility and slightly less upside, as compared to public REIT equities. The chart below shows the historical performance of the MSCI equity REIT index as compared to the MSCI preferred REIT index. Generally, the REIT preferred stocks will offer a much more stable and consistent return than equity REITs. Investors should find a better vehicle than cash to hold their uncalled capital because doing so can mean significant dollars gained over a lifetime. While every private fund manager intends to invest 100% of committed capital, market forces or a manager’s capability may leave some – even half – of a commitment uninvested in the short-term. To effectively maximize returns, investors should not over-commit to private opportunities and make sure they manage their liquidity effectively. The tactics outlined above are a great tool to continue building long-term wealth.